Prized by fishermen for its spirited antics at the end of a fishing line, the adult tarpon can measure 8 feet or longer and weigh 200 to 300 pounds. 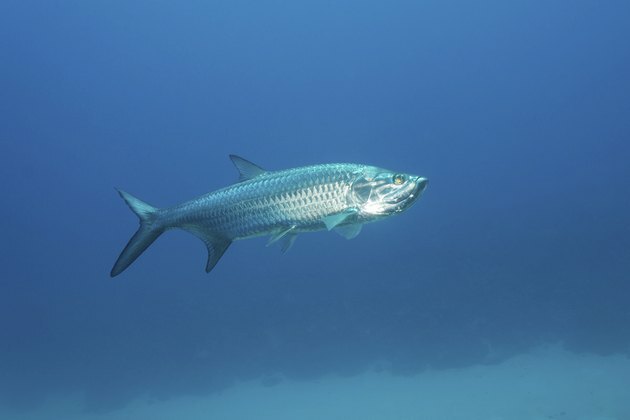 In the United States, the tarpon usually is caught for sport -- and then released. As a bony, strong-smelling saltwater fish, it may be more trouble than pleasure to eat. One practical method of preparing a bony fish, however, is to poach it, pick the meat off the bones and use it to make well-seasoned fish cakes. Fill a large pot with 2 quarts of chicken broth. Set it on a burner on high heat. If your fillets are long, cut them into pieces small enough to fit together in the pot. When the broth begins to boil, turn the heat down to medium-high. As the boiling liquid slows to a simmer, meaning you see movement in the water but no bubbling, put the fillets in the broth to cook. After about 10 minutes, or when the fish is done, take the pot off the stove. Use a large slotted spoon to scoop out the fish and set it on a plate to cool. When the fish is cool enough to handle, manually pick the meat away from the bones. Place the meat in a bowl and discard the bones. Grind the fish meat in a food processor but only briefly. You want small chunks, not a smooth paste. Return the ground fish to the bowl. Add a finely chopped onion, a finely chopped green bell pepper, 2 to 3 pounds of mashed potatoes, 4 egg whites, Dijon mustard, garlic powder, paprika, cayenne, salt and pepper. Mash thoroughly with a fork. Dust the counter with flour and scoop a heaping tablespoon of the fish mixture into your hands. Roll it into a ball and flatten it slightly into a cake on the counter. Repeat with the rest of the fish mixture. Heat 2 tablespoons of olive oil in a frying pan on medium-high heat. Set a layer of fish cakes in the pan and cook them until the edges are crispy, about 3 minutes. Flip them over and cook for another 3 minutes. Remove the cooked fish cakes from the skillet and drain them on paper towels. Repeat Step 4 for the rest of the fish cakes, cooking and removing one batch at a time. Cooked fish cakes may be kept warm in the oven until all of the batches are finished cooking. To reduce exposure to contaminants, remove skin and fat from fish before cooking it. Fish provide low-fat protein and omega-3 fatty acids, important for maintaining heart and brain health. Instead of frying, consider rolling the fish cakes in bread crumbs and baking them at 350 degrees Fahrenheit for 15 to 20 minutes. If you do not have a meat processor, use a sharp knife to finely chop the fish. Those who eat tarpon recommend using only the smaller specimens. Do not undercook fish. The U.S. Department of Health and Human Services recommends cooking fish until it reaches an internal temperature of 145 degrees Fahrenheit. At this temperature, the flesh will appear opaque and flake easily when you separate it from the bone with a fork. When eating, be aware that you may have missed tiny bones. Remove any visible ones and make sure you chew thoroughly before swallowing food. If you catch your own tarpon with the intent of cleaning and cooking it, be aware that some states and countries require you to have a permit to keep this fish. If you do not have a permit, you must release it back into the water.